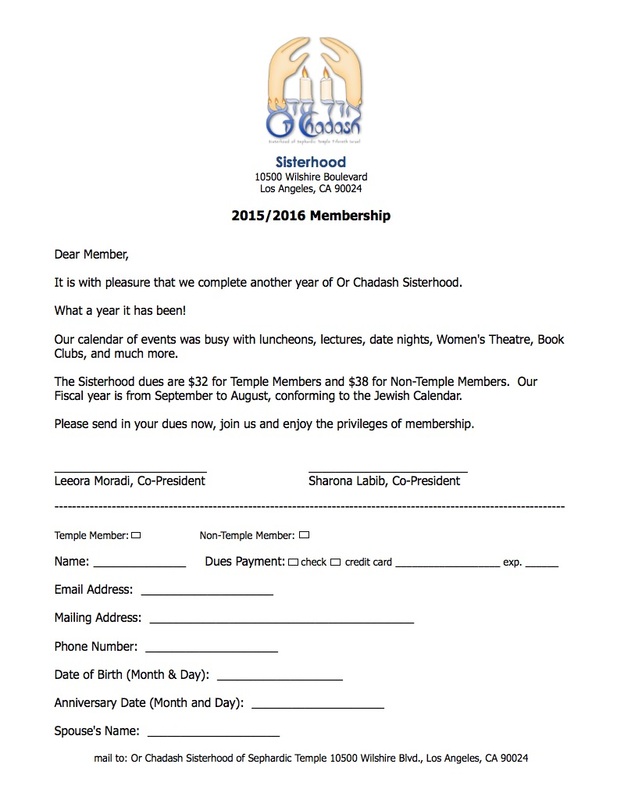 It's time to renew your membership to the Sephardic Temple Or Chadash Sisterhood. We would like to invite all current and previous members of our Sisterhood to renew their membership. We are pleased to maintain membership fees at last year’s rates of $32 for temple members, and $38 for none temple members. Without your participation and dues support, the Sisterhood could not fulfill its commitment towards our mission. Your membership means that we can continue to be an active and vital part of the community. This year we have scheduled for many exciting programs such as informative guest speakers, cooking series, holiday celebrations, Tikun Olam, and much much more! Your participation and dues support make these and other valuable programs possible. Every member strengthens the organization's existence. Even when you don't have the time to be personally involved, your membership dues support all involved in bringing these programs to our community. As a member, you will also be taking advantage on discounted pricing for admission of events. Thank you for your membership to Or Chadash Sisterhood. Your involvement is important and very much appreciated. Please print complete and return the enclosed renewal form before the end of September so you can continue to receive mailings without interruption.